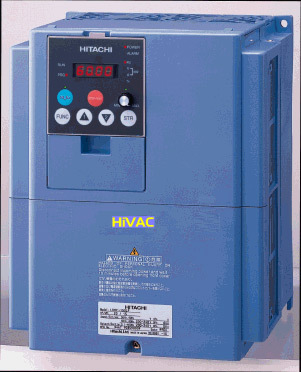 HITACHI INTRODUCES NEW HiVAC INVERTERS AND HiPASS BYPASS PACKAGES FOR OPTIMUM ENERGY SAVINGS : News Releases : Hitachi America, Ltd.
TARRYTOWN, NY, September 1, 2004 -- Hitachi America, Ltd., Power and Industrial Division, today announced its new HiVAC Series of inverters. The HiVAC inverters are ideal for a wide variety of variable torque applications, including fans, cooling towers and pumps. HiVAC features include: PID (Proportional-Integral-Derivative) control and automatic energy savings, anti-wind-milling, loss of reference signal, intelligent terminal systems, three (3) programmable output relays, and RS485 communications. HiVAC with SC-OPE3H enhanced HVAC LCD keypad will have embedded Building Automation System protocols such as Johnson Controls Metasys® N2, Siemens APOGEE™FLN, MODBUS-RTU, BACNET®. An optional LonWorks® interface card also is available. The LCD keypad is also equipped with Hand/Off/Auto, Quick Menu, Read/Write function. The HiPASS bypass package is designed for crucial applications so that no system downtime can occur and the customer’s system can remain in operation. In HVAC applications, this allows heating or cooling to be maintained at all times. With use of standard PID control, desired temperature can be accurately maintained. The HiPASS Package has been designed for ease of drive commissioning and system setup. The compact and space saving NEMA 1 Side by Side Wall mountable enclosure design allows for use of minimum wall space. All HiPASS Package internal components are easily accessible due to thoughtful design practices. The HiPASS user-friendly customer terminal strip allows access to the HiVAC drive’s intelligent inputs, analog inputs and BAS (Building Automation Systems) connections.